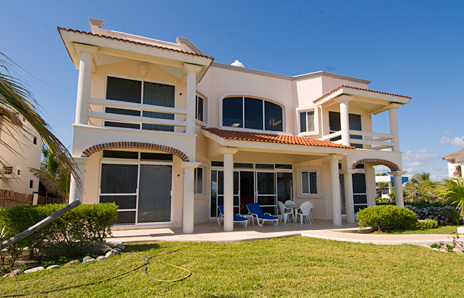 4 BR, 4.5 Bath Akumal Vacation Rental Villa. 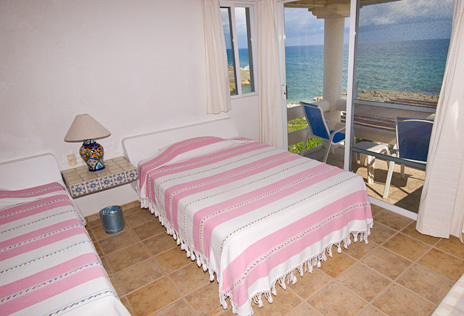 BR #3: Second floor, king bed, ocean view, private bath, patio, a.c.
BR #4: Second floor, 2 double beds, ocean view, private bath, patio, a.c.
Studio/TV room: Second floor, 1 double futon. Shares bath with BR #4. 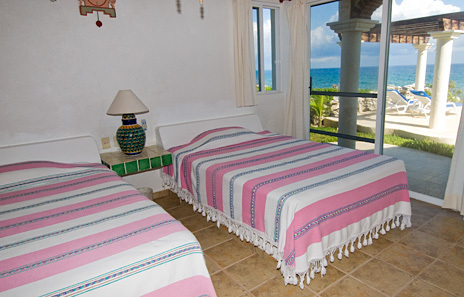 For over 8 guests, add $250 per person per week ($150 for children 9 and under). Babies 12 months and younger sleep in a crib at no additional charge. 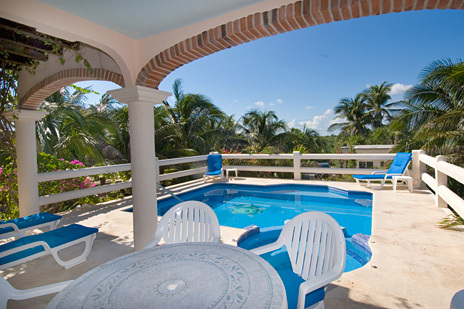 Twin Palmas is a lovely 4 bedroom vacation rental villa located on Half Moon Bay in Akumal. 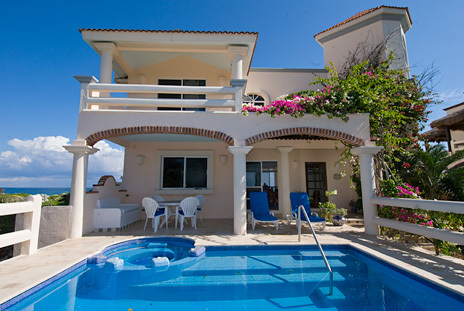 A large 2-story vacation villa with 4 BRs and 4.5 baths, Dos Palmas takes full advantage of the magnificent ocean views. It is a stylish propety that is impressive from the moment you see it when you drive i. 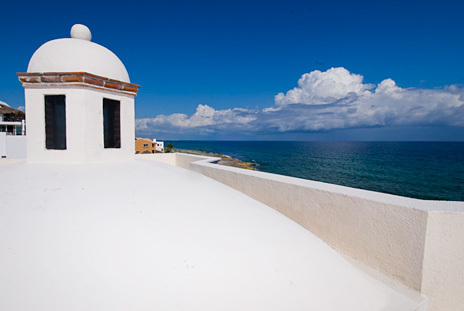 The light rose color of the villa is striking against a deep blue sky. Add the deep green of the surrounding jungle, put on some Jimmy Buffet mood music and you're ready for Margaritaville! 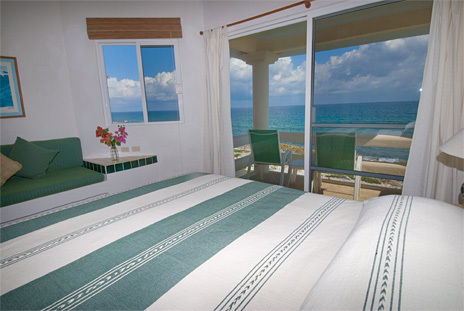 All bedrooms have private baths, ocean views and sliding glass doors to patio or balcony areas. 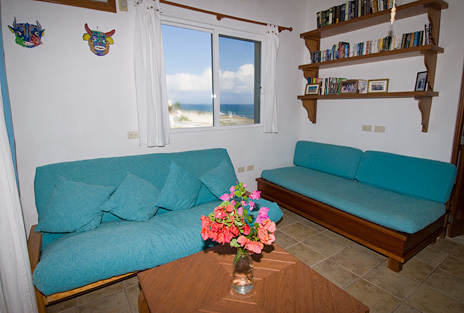 A studio on the second level is used as a TV room and also has a double sleep sofa. 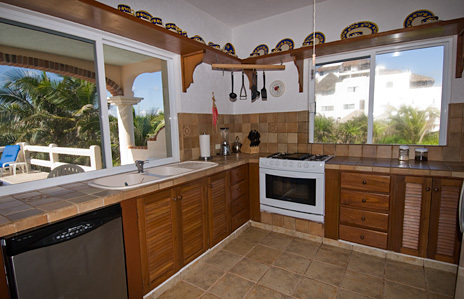 The studio can be used as an extra bedroom and shares a bath that adjoins this room and another bedroom. 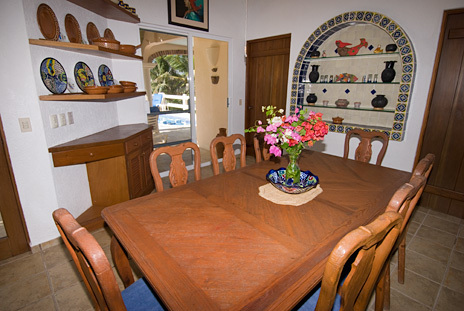 The living room and dining room have ocean views on the main floor. These rooms are open two stories and are topped with a domed brick ceiling. 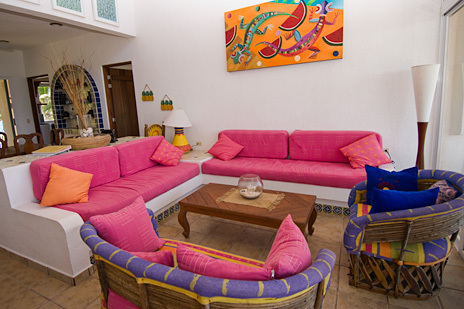 Bright hand-painted tiles are used throughout the property. 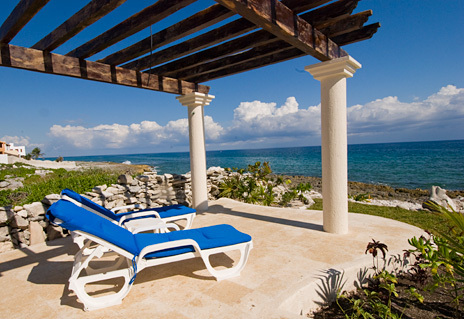 The pool and patio area have plenty of lounge chairs for afternoon sunning or evening drinks. 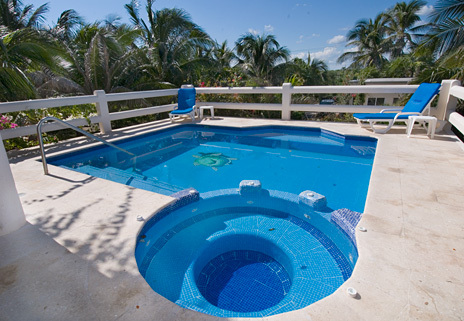 The swimming pool has a couple of unique features, including a jacuzzi type area with jets for gentle bubbling action. 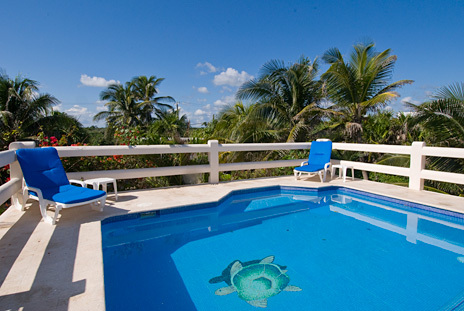 A decorative turtle rests on the bottom of the pool and children will have fun climbing unto its back. 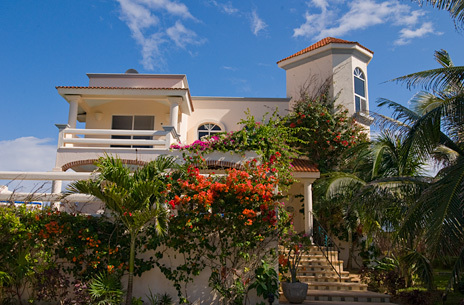 A third-story rooftop observation area is perfect for a relaxing evening as you count the stars, watch the sun set, or in the day time, work on an all-over tropical suntan. 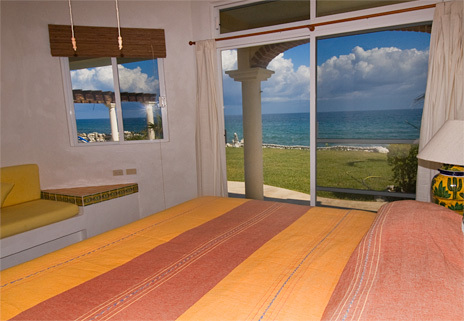 The views are spectacular at Twin Palms vacation rental property in Akumal.